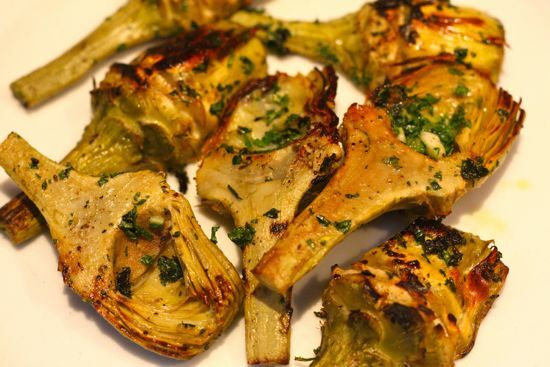 This year, we decided to try grilling artichokes, which are plentiful at the farmers markets right now. I especially like the smaller ‘chokes with their tender stems. The results were extraordinary – the buttery, nutty flavor of the thistles playing off the smoke of the grill and a parsley paste heady with garlic and lemon. Braising in white wine and olive oil beforehand contributed yet another layer of flavor. It does take a little more effort to prepare artichokes for the grill. You’ll need to strip each one down to its most tender leaves and remove the hairy choke at its center. On the other hand, eating artichokes requires less effort when you don’t have to remove the leaves as you go. If you need a refresher on prepping, check out this tutorial from my earlier post on artichoke risotto. 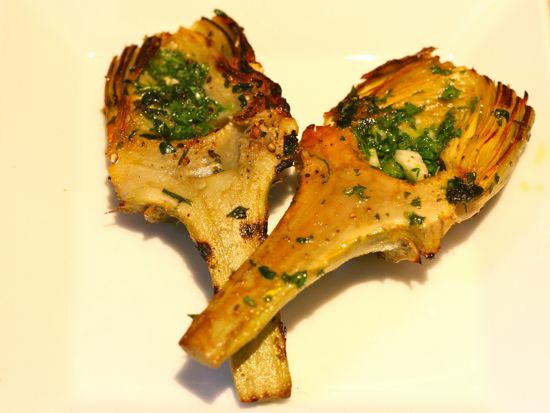 For this dish, though, you will slice the prepared artichokes in half rather than eighths. To make things easier at dinner time, you could prep and braise the artichokes early in the day, then refrigerate them until it’s time to grill. The actual time over the open flame is relatively short. Just be sure to make plenty. They’ll go fast. Squeeze lemon juice into a large bowl, half filled with water and drop in the rinds. Prepare artichokes by removing outer leaves down to the tender, yellow-green layer. Cut off about an inch of the top end, slice in half and scoop out the hairy choke with a teaspoon or small, sharp knife. Drop artichoke halves in the lemon water. You can prepare the recipe up to this point and leave the artichokes in the water, covered, in the refrigerator for several hou. When you’re ready to braise, remove artichoke halves from water with a slotted spoon and let drain on paper towels. Heat 3 tablespoons of the olive oil over medium heat in a large, wide skillet. Add drained artichokes in a single layer and stir to coat with oil. Add wine, water and salt and pepper to taste and bring to a low boil. Reduce heat to medium low and simmer, covered, until tender, about 10 minutes. Remove lid, raise heat to medium, and boil off all the liquid, being careful not to burn the artichokes. Remove pan from heat and let cool. You could refrigerate the braised artichokes, covered, until it’s time to grill. Mince parsley, garlic, lemon zest and a generous pinch of salt together until very fine. Place in a small bowl and stir in the remaining 3 tablespoons of olive oil to make a thick paste . Rub the paste all over the artichoke halves. Serve warm. I made these Saturday. fabulous. Now I don’t have to go to Buck’s to get these. They do big artichokes this way cut in half and then stuff one side with cold BBQ shrimp and the other with crab meat. Good but too big for one human to eat. will you please email me so I can get your address? for some reason I don’t have it.